Capt. 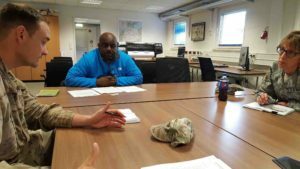 Ryan Oliver discusses contractual support requirements for 3,000 U.S. military participating in the Austere Challenge 17 exercise with Mr. Gaudie Frazier and Sgt. 1 st Class Susan Menk at the Exercise Support Division on Camp Aachen, Grafenwoehr. Photo by Capt. Kimberly Marra. GRAFENWOEHR, Germany — With exercise Austere Challenge 17 set to commence January 2017, the 675th Contracting Team’s Capt. Ryan Oliver and Capt. Kimberly Marra recently conducted customer education at the Exercise Support Division here at Camp Aachen. The purpose of contracting 101 is customer education. The intent is to explain contracting procedures, proactively aid customers to develop requirements, develop and maintain open lines of communication, and stress the importance of meaningful partnerships with customers and contractors to ensure the goals and objectives of our supported activities are met. Attendees in the customer education session included representatives from both U.S. Army Europe USAREUR G37 Training Exercise (TREX) and the 103 Expeditionary Sustainment Command (ESC), the National Guard Unit who will be performing Forward Operating Base Mayor duties during the exercise. The 675 th CT discussed requirements for leased vehicles, custodial services and complete dining facility support for more than 3,000 U.S. military personnel. Both Oliver and Marra ensured the customers left the meeting with defined requirements and a clear understanding of how to accurately prepare a requirements package. Additionally, the team explained the training requirements of the Contracting Officer’s Representative, or COR. They described the role of the Quality Assurance team at the Regional Contracting Office at USAG Bavaria. This customer outreach session will no doubt establish the foundation for a streamlined, quality procurement and will increase stakeholder ownership by getting the customer involved early in the process. These stakeholder engagement opportunities have a direct impact on readiness. Our outreach efforts improve readiness by bridging the basic contracting Knowledge, Skills, and Experience gaps within our supported activities. These gaps occur as a result of personnel turnover and updates in contracting policy. Training opportunities conducted by the Regional Contracting Office at USAG Bavaria are available in the Garrison Events calendar at www.bavaria.army.mil/calendar/events. For more on what the Regional Contracting Office Bavaria can do for you, visit the contracting webpage on the garrison website.